Stuffed cabbage with store-bought sauce. 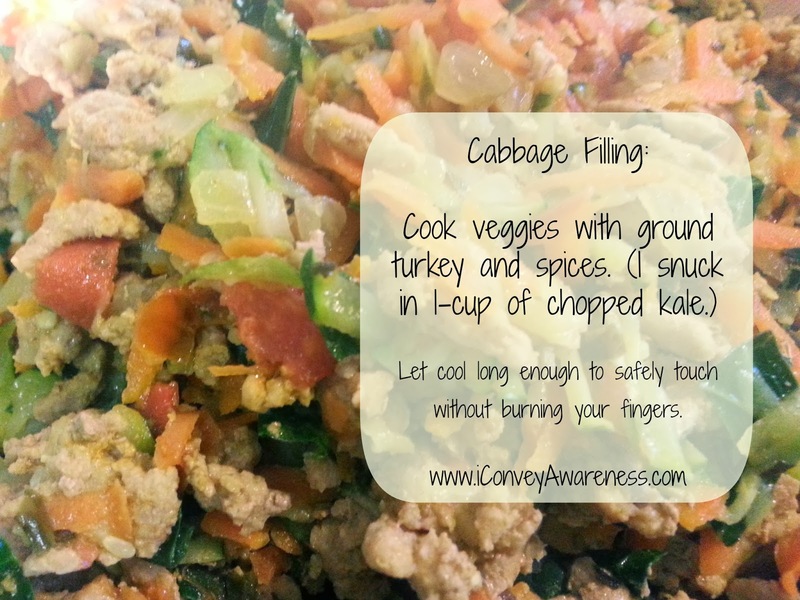 Are you contemplating making stuffed cabbage but short on time and maybe experience? Try this recipe on for size then let me know if it can be made simpler. Caveat: It must still pack nutrition in every bite and must have at least 4 different vegetables. Let's get started with the ingredients list first. 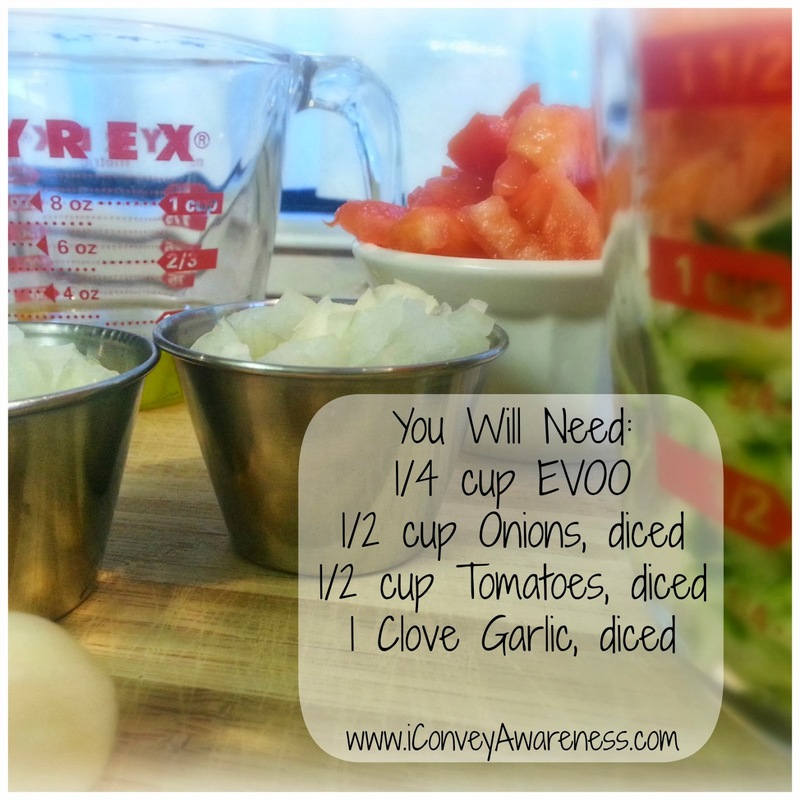 Notes: When I don't make my own tomato sauce (like this), I opt for organic spaghetti sauce in a jar. 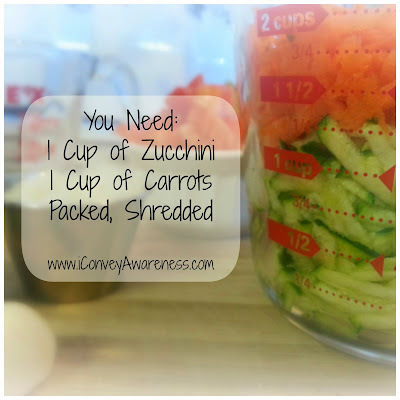 I can reuse the jars and I don't have to wonder about the BPA from the lining of the cans seeping into the sauce from the acidity of the tomatoes. (I have used canned foods in a pinch, including tomatoes but I don't make a habit of it.) There are specific foods that I prefer to buy organic every time and one of them is tomatoes; however, where I reside does not always have organic tomatoes. So, because the benefits of eating produce is better than not, I ensure that the label (if packaged) does not have any unnecessary added ingredients. I decided at the last minute that my cabbage filling needed more vegetables so I added 1 cup of roughly chopped kale (not pictured in the raw ingredients above). Purchase organic extra virgin olive oil (EVOO) when possible or from a trusted supplier (organic label may not be necessary). Much of what's found in the stores (inorganic) is not 100% olive oil and may have fillers like canola oil or other inferior oils. A website I refer my clients to is California Olive Oil Council and you can find a list of suppliers around the nation who sells superior olive oils. 1. Heat oven to 375*. 2. Bring water to a gentle boil in a large pot. 3. In a skillet, add the EVOO and heat to medium. Add onions until golden brown then add garlic. 4. Prepare the vegetables while onions are browning. 5. Add the seasonings to the onions and garlic then add shredded carrots. 6. Slowly add the next vegetables one at a time allowing each to cook for about 3 minutes. Stir occasionally. 7. When all the vegetables have been incorporated and cooked slightly, leave them in the skillet pushing them to the outer edge when you add the ground turkey. The turkey will absorb the flavors of the vegetables while it's browning. 8. When turkey is brown, mix the vegetables with the meat. Move to a bowl. 9. When the water comes to a gentle boil in the pot, carefully add your head of cabbage and let it simmer for about 5 minutes. 10. 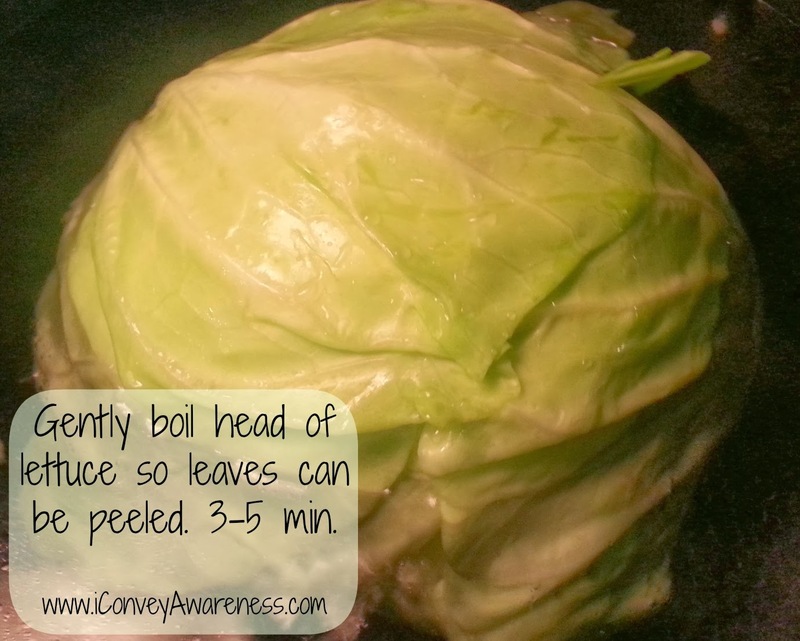 Carefully remove the cabbage from the water and gently peel the layers of cabbage leaves laying them flat to dry. A medium sized head of cabbage will give you about 7-8 leaves (or 7-8 cabbage rolls). Cut out the tough core of the cabbage. 11. 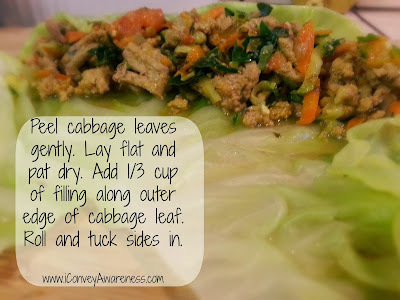 When leaves are somewhat dry, add about 1/3 cup of cabbage filling to the outer edge of the cabbage and roll inward tucking in sides as you roll forward. 12. 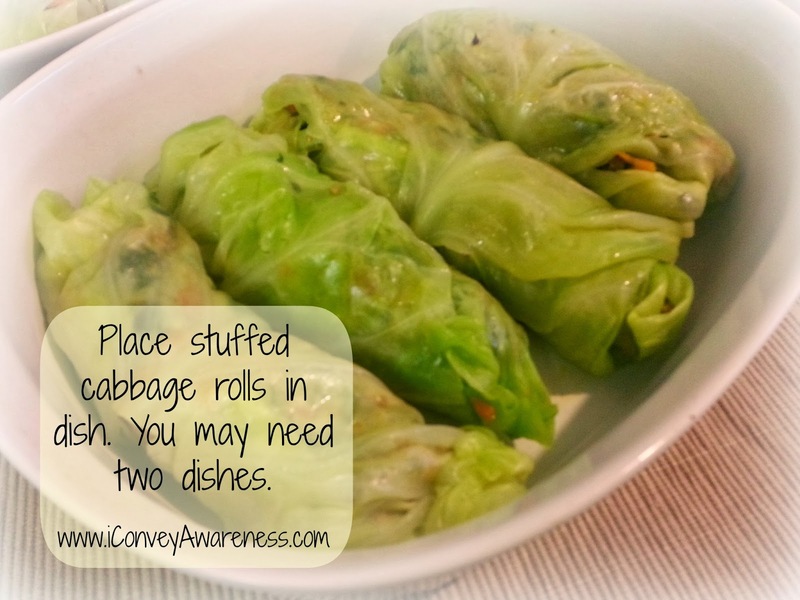 Places stuffed cabbage rolls with seem facing down in a oven safe dish. 13. Top cabbage rolls with spaghetti sauce. Cover and bake for 30 minutes. 14. Buon Appetito! Enjoy your stuffed cabbage with 6 other vegetables! My family enjoyed these immensely. I love that they love vegetables! I served the cabbage rolls with jasmine rice but you can choose to eat them alone. They're filling and flavorful. 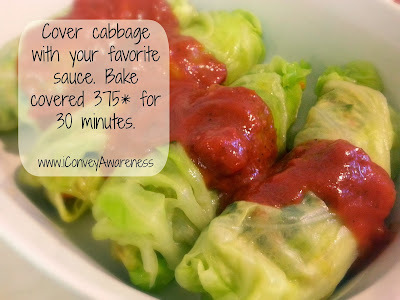 What are some ways you use green cabbage? Keep a couple of large heads of cabbage in the freezer; take them out to defrost the night before making the rolls & voila! wilted/pliable cabbage leaves to stuff without messing with scalding water. Nice tip! I will keep this in the back of my mind. My freezer is too small to hold any cabbages but it's on the plan to buy a second fridge/freezer for the garage. Thanks again! =) Be well.